Because it’s all about generating new ideas… which we all love to do (sometimes to our own detriment). But what you may not know is how effective this skill of yours actually is when it comes to Facebook Ads. Your greatest advantage is your ability to come up with fresh ideas, write them quickly, and test them. So how exactly do you “test ideas” in your Facebook Ads? The majority of your Facebook Ad results come from a small portion of the ad. It’s what we call the “Above The Fold” copy. By changing the angle and plugging new ideas there, you’ll quickly discover which ads are the winners and losers. From there, you can scale up on the best performing ads. 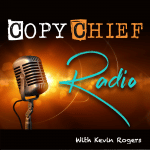 All it takes is a 20-minute brainstorming session, which we’ll cover in this new episode of Copy Chief Radio. Plus Mike and I dive deep into 3 simple “hooks” you can start brainstorming with.